Our brand name is heavily associated with televisions, stereos, cameras, and other consumer electronics. Very few people are aware that we also offer B2B solutions, including for the retail industry. So visitors at the Tech. event, staged by Retail Week magazine and World Retail Congress, were understandably but pleasantly surprised to see a Panasonic stand. In fact, our dedicated Panasonic Retail business unit was only established on 1 April 2018, and this was the first time that it participated in a major event. In total, over 200 visitors stopped by our Panasonic stand, primarily retailers and technology vendors. The technology vendors demonstrated a clear eagerness to collaborate and to combine complementary products – in order to create more comprehensive and user-friendly offerings. The retailers included the likes of Vodafone, Primark, Tesco Technology, Footlocker, and Aldi. Most were interested in solutions addressing two key issues: operational efficiency and customer engagement. On the operational efficiency front, the highlights at our stand were our automatic shelf monitoring (ASM) and electronic shelf label (ESL) systems. ASM is an out-of-stock solution: it reliably identifies empty areas on shelves and then issues a corresponding alert. This slashes the time spent reviewing inventory, and frees up staff for customer service. Our ESL system, on the other hand, helps bricks-and-mortar shops cut the costs and inefficiencies associated with paper-based labels. This solution enables centralised price management and dynamic pricing. It also opens up new contactless marketing activities, such as geolocation, customer identification and targeted offers in real time. Visitors wanting to improve customer engagement were keen to learn about LinkRay, which uses LEDs to transmit digital content to mobile devices. Digital signage displays, signboards and light sources can therefore be transformed into 1-to-1 marketing tools for smartphones. For example, retailers can provide additional buying incentives and support online ordering. The Panasonic Space Player also garnered significant attention. This hybrid lighting solution combines the features of traditional lighting and video projectors in a single spotlight-shaped design. It can be employed to create engaging product visualisation – including mapping images onto mannequins. Customers can even interact with projections via a remote app. All in all, the Tech. event was a wonderful opportunity to showcase our solutions, and to share ideas face-to-face with potential customers and others. 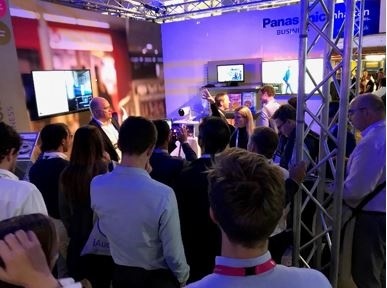 Chris Brook-Carter, Managing Director of Retail Week and World Retail Congress, stated, “Retail Week were delighted with the high amount of engagement between retailers and Panasonic at Tech. Demonstrations showed retailers how to achieve their digital transformation goals through driving productivity and efficiency across their stores.” Physical retail is undergoing radical and rapid change, and Panasonic will be at the forefront. We will continue to raise awareness of our technologies in this space. For example, we will be participating in Retail Week’s The Future of the Store master class on 19 October 2018.